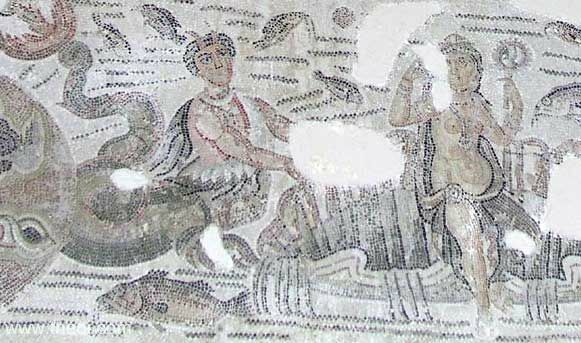 The goddess Aphrodite (Roman Venus) is borne across the sea in a cockle-shell by a pair of Ichthyocentaurs (fish-tailed centaurs) after her birth from the foam. She is crowned with a string of pearls and holds a mirror in her hand. To either side a pair of Tritons (see other image) herald her birth with conch-shell trumpets.